After leaving Ball State and the Yorktown eLearning Conference, we traveled Southeast and found ourselves at the very edge of the state in Richmond. 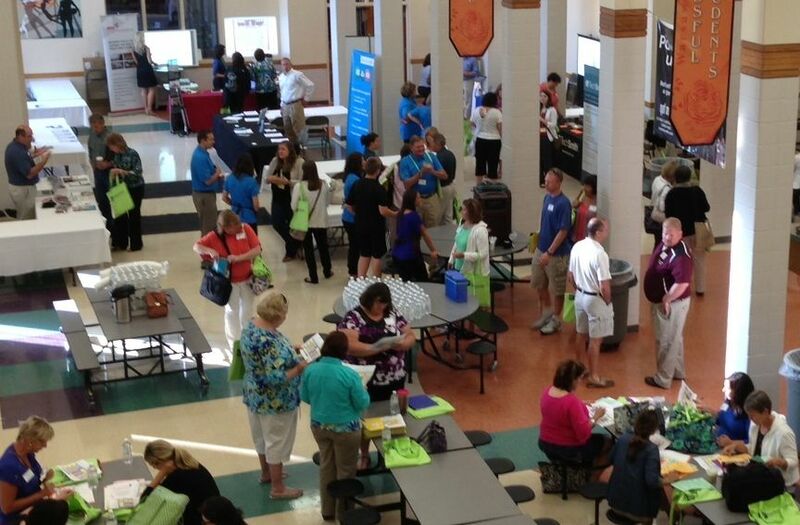 This is the second summer Richmond Community Schools has invited educators in to share in the learning as part of their We R Richmond Tech Expo 2 conference. This year the focus is on transforming traditional curriculum to digital platforms. 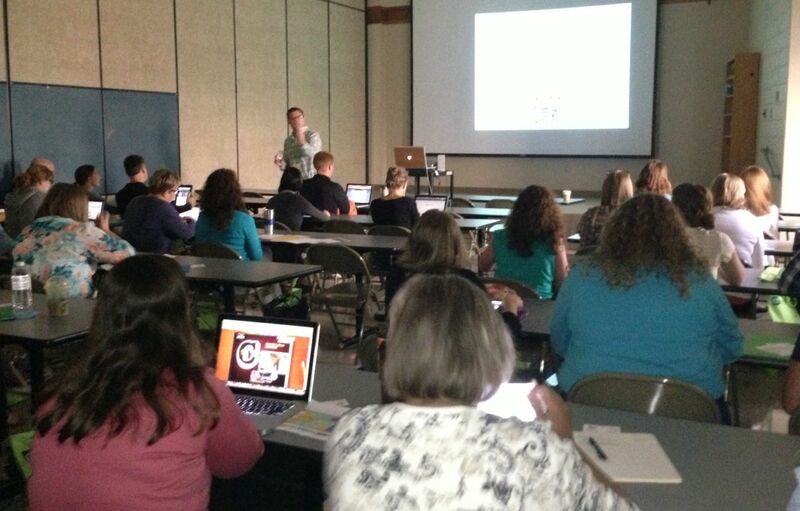 The two-day conference provides valuable insight for participants wanting to discover new concepts and ideas about moving from a traditional curriculum to a digital one. Building on that foundation, participants will be learning to create, publish and access digital content. Day 1 of this sold out conference opened in the Civic Hall Performing Arts Center with Rob Tidrow, Technology Coordinator, welcoming attendees and setting the schedule for the 2 days. Rob challenged the audience to be leaders in the changes needed to move teaching and learning to a digital, student centered environment. Rob introduced the day's keynote speaker, Will Richardson. 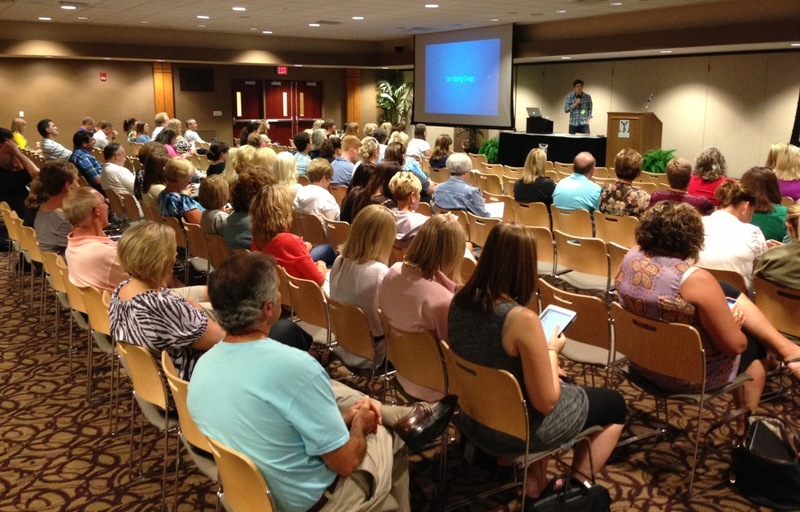 Will opened the session by sharing that he is traveling Indiana as part of the Summer of eLearning at 4 different conferences! (Close to earning his honorary Hoosier citizenship!) If you know Will's work, you know he is all about collaboration and connection. True to that belief, Will provided a couple of ways for everyone to get in on the conversation. Join in on Will's backchannel at Today's Meet or follow the learning for both days on twitter #INeLearn. Will kicked off the discussion with the question: What is confusing you about education today? After some discussion with the audience, Will shared his 4 starting points/beliefs on what is confusing about education today. 1) This is the most disruptive moment in education ever - not exactly what most people signed up for when they entered the profession. 2) This is the most amazing time to be a learner-ever- We have the sum of human knowledge in our pockets. 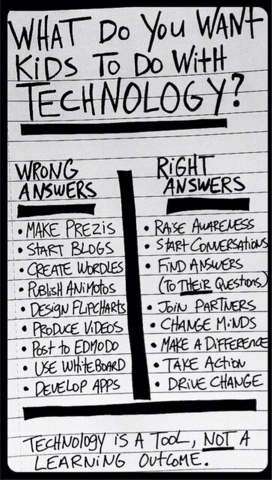 3) Schools need to be different, not better. 4) Computers should be used to "amplify human potential." These beliefs led into the next hour's look at how we prepare our students for a world that looks nothing like the world in which we live today. 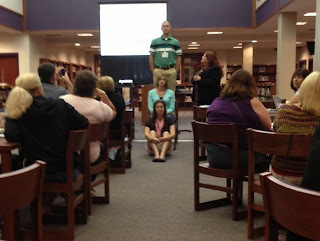 Will shared examples of students who are learning on their own and truly making a difference. Check out these projects: We Stop Hate, Conserve It Forward, and Super Simple Sylvia's Maker Show . He continued to challenge the audience with his thoughts on the change from scarcity of knowledge to abundance, and rethinking how we use technology and how we teach. Traditional teaching is about delivery and waiting for education to happen - just in case I need to know it. 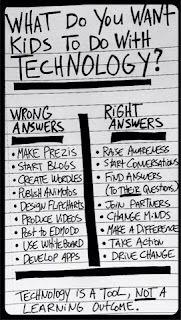 vs Modern Teaching (Will's term for 21st Century Learning) which is about discovery - just in time when I need to know it. To learn more about Will's ideas on the changes that are needed in education follow him @willrich45 or get his new book, Why School? Day 2 will offer sessions for Online Content Curation, Flipping Tools and Techniques, Global Collaboration, and Pedagogical Challenges to name a few! WE ARE RICHMOND - a great place to learn! 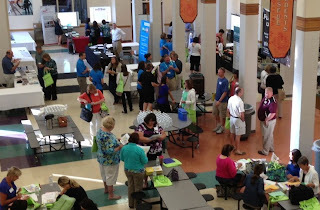 As their name points out, the event coordinated by Yorktown Community Schools was not just another eLearning conference. 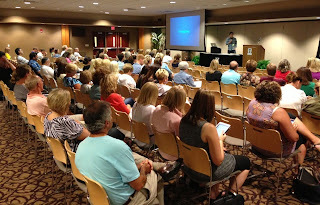 It was a unique partnership with Ball State University and hosted in the beautiful BSU Student Center. 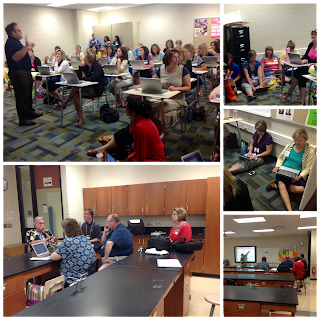 The workshop sessions ran 2.5 hours, allowing a deeper dive into the content, and presenters included a combination of Ball State faculty and presenters from Yorktown. For the first session, I joined Corinne Hoisington, Associate Professor from Central Virginia Community College. She kicked off her talk using Google's Zeitgeist 2012 as an example of an engaging bell-ringer to grab your students' attention. 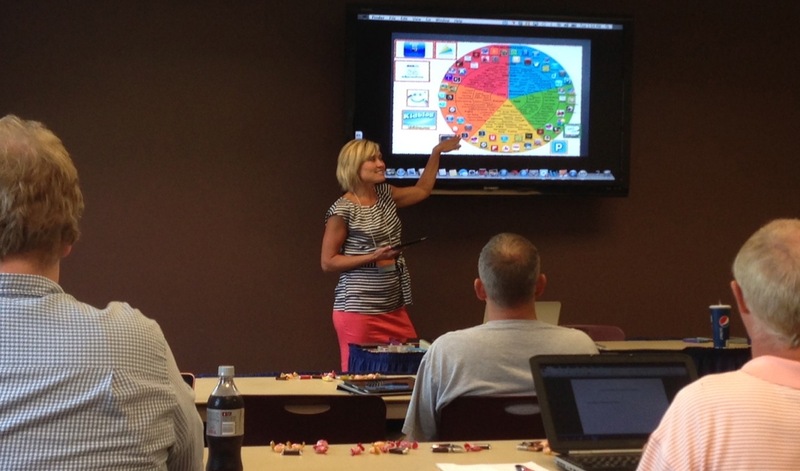 Then she shared a number of classroom technologies she dubbed "free and fabulous!" These included middlespot.com, a site for creating collaborative content dashboards. She also taught me that WolframAlpha now has an interesting feature that will analyze an uploaded image. Another big hit was the Google Art Project which has fantastic ultra-high-res photos of more than 45,000 works of art. If you haven't yet been astounded by this yet, check out Vincent van Gogh's The Starry Night and zoom in by double-clicking until you can not only see the brush strokes, but also the places where he let the canvas fibers show through! 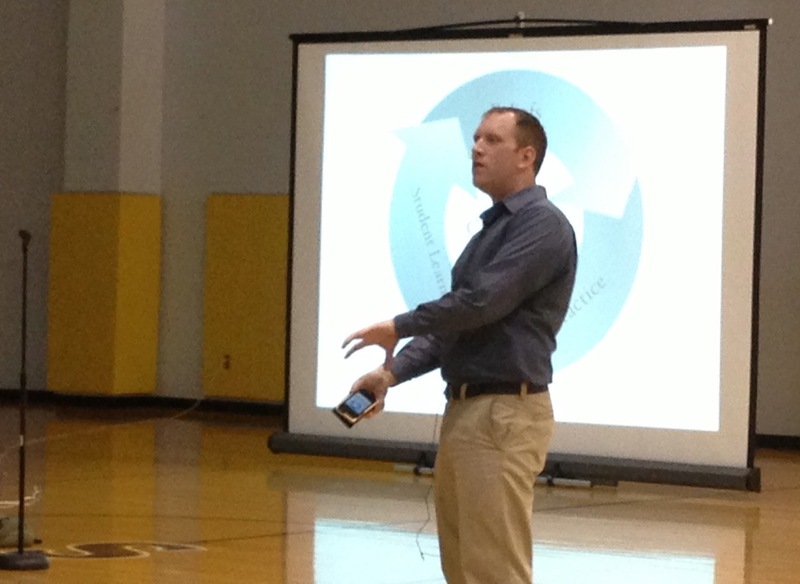 Brian Bennett's keynote "One Flipping Change," highlighted his learning in the changing landscape of education. He empowered participants to motivate change by building relationships, both with colleagues and with students. Taking a page from Chip and Dan Heath's book, Switch, Brian talked about the battle between our rational minds and our "inner elephant." His advice was to pick just one thing learned at the conference that they would commit to doing when school starts. "We don't have an education crisis in America, we have a leadership crisis." This was a statement made by Julie Evans, guru of the national Speak Up survey, and was seconded by the small gathering of EdTech leaders from states across our nation. I share the quote, because this morning I watched Evansville's eRevolution conference impact that reality for a group of school leaders. 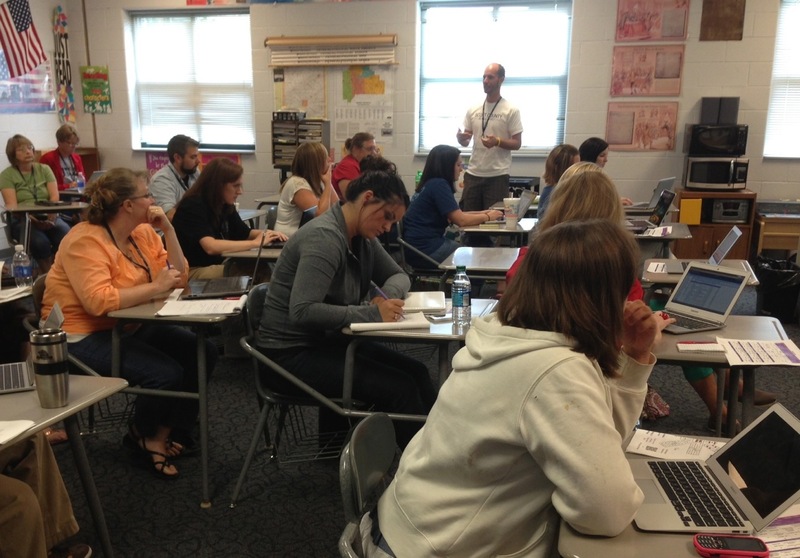 EVSC's conference, now in its fifth year of bringing great eLearning sessions to educators, strengthened its offerings this year with a strand called Leadership in the Digital Age. Presentations in this strand were designed to support the school leaders in the area, as well as principals who drove in from hours away! The leadership strand was anchored by Eric Sheninger, who has gained national renown for his use of social media at New Milford High School where he is Principal. It was enlightening to hear Eric talk about his first experiences with Twitter. His initial "lurking and learning" resulted in a sort of jealousy as he learned about great things going on in classrooms across the country. He then made his new learning an example for his school community. "If you model social media as professional tools, that is how your stakeholders are going to treat them," Eric shared. Despite the fears most have about opening social media to community comments, he reports removing only a handful of inappropriate posts in the last three years. Adam Bellow's energetic keynote made the morning, and the afternoon saw more fantastic learning led by teachers and coaches. I stopped in Missy Feller's tool sharing and learned about a great site called Wing Clips, where you can find thematically sorted movie snipets. 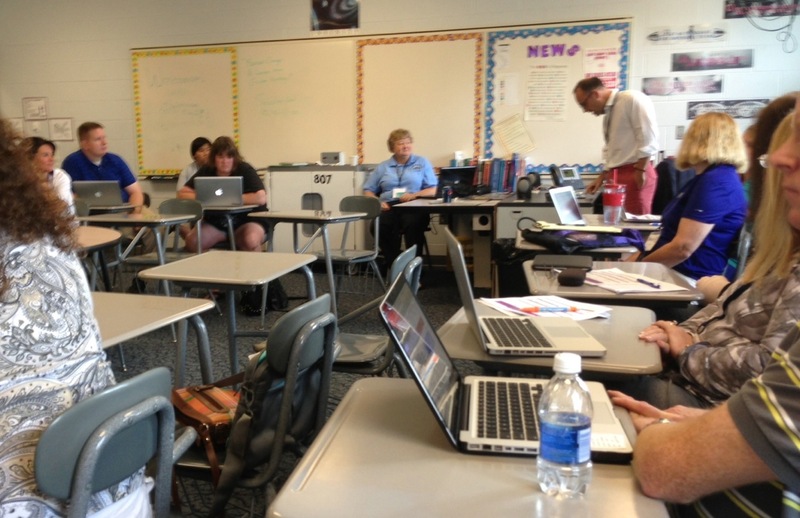 Across the hall, Tim Wilhelmus and Jeff Tron shared some ideas for engaging students in creative work. They highlighted animation tools like Voki, Blabberize, and Go!Animate, that allow students to share what they know in creative ways that go far beyond reports and tests. The icing on the cake (or baklava!) was the afternoon app shootout with Adam Bellow and Leslie Fisher, who stunned the audience with a barrage of technologies like Story Builder and Aurasma. 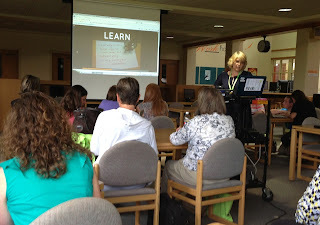 Leslie then gave a great interactive demo of InfuseLearning with an auditorium full of educators using their own devices for student response. See the complete list of the apps they shared in this Google Doc. Like Disney, this conference was too big to see in one day! Check out #EVSCREV13 as the learning continues tomorrow! This week the halls of South Montgomery High School are bright with planning committee members, tech support, volunteers and presenters sporting the Peace, Love and EdTech Conference tie dye tees. Sixties tunes filled the space as 120 attendees made their way through two days of offerings and connected over 180 devices to the building's wifi to download apps, contribute to backchannels and access presentations. 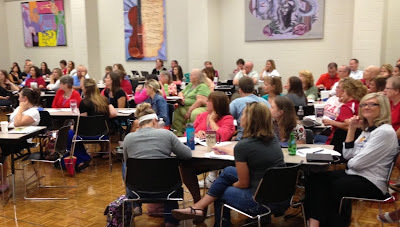 Will Richardson, a familiar voice in Indiana due to his work with Powerful Learning Practice Network, opened each day with keynote messages that he’s shared internationally. He spoke to the audience as an educator with over two decades of classroom experience, as a parent of two teenagers and as a passionate advocate for changing schools. 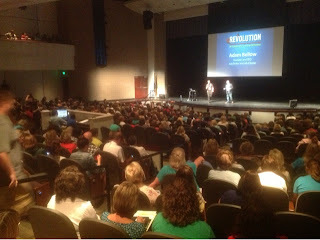 On Monday, Richardson’s message “Learning in a Networked World: For Ourselves and for Our Students” took the audience through a reflection of what type of learner they are. 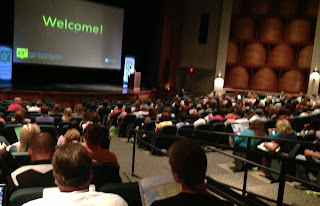 After walking us through the time of scarcity of information and into today’s abundance of information, his point was “better matters little if what people need and want is something else.” Sending attendees off to day one sessions and workshops, Richardson noted that this rethinking of who we are as learners has to start with confusion. He urged attendees to let that carry into their morning breakout sessions. 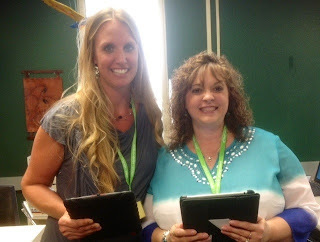 Teachers for South Montgomery received the iPads they will be using in the classroom next school year. 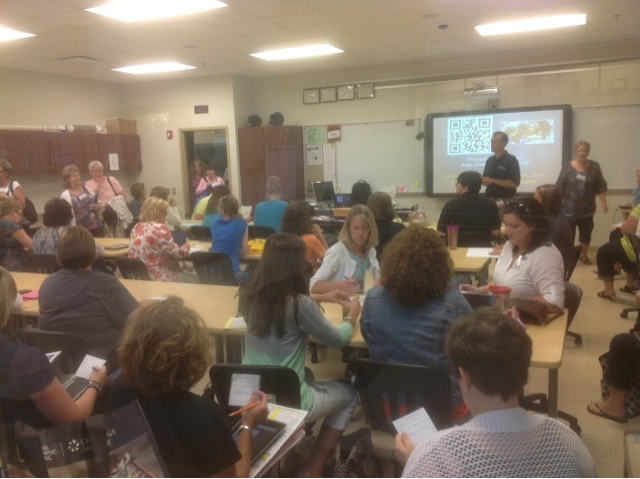 While there were packed sessions around learning their new tool and its potential uses, there were also great discussions occurring in sessions with titles devoid of references to devices or tools. 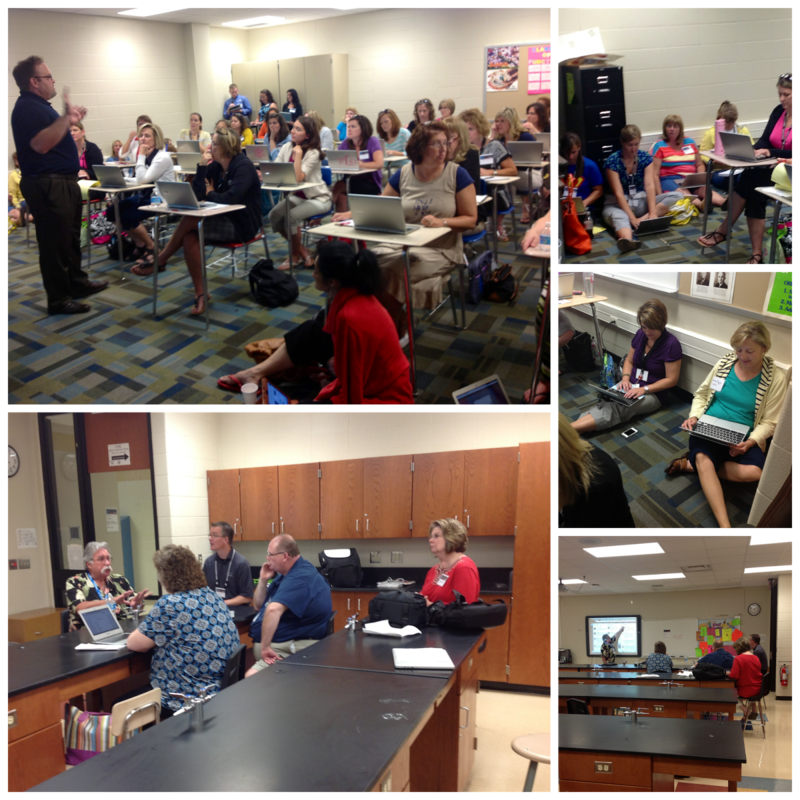 On Monday, these included sessions such as Failure to Grow: Risk Taking and Technology Integration and the popular Ditch That Textbook session. These sessions were lead by an administrator and a former instructional coach and by a classroom teacher; all of whom were willing to share their materials and resources publicly---one of the things Richardson called us to do as learners and professionals. On Tuesday, Richardson noted he rarely does back-to-back keynotes with the same audience and joked about the likelihood of an audience returning to hear more of his message. Today’s talk about “Bold Learning for Bold Schools: Making the Jumpfrom Traditional to Modern Learning” began with Richardson reminding us that yesterday’s talk was meant to confuse us. Then he proceeded to open with more questioning. He shared hard truths and talked about the hard work that comes with moving away from institutionally organized learning. Richardson actually had us raise our right hands and take an oath before we made our way to the day’s sessions. The oath was two part. In the first breath, we all repeated, “I want to be found” and in a second breath… “by strangers on the internet.” The next two sessions I’m going to briefly note were lead by two professionals that took that oath long before the Peace, Love and EdTech conference. I’ve linked their Twitter accounts so that you can follow them and the learning they share. Today was the first time I met these educational leaders, but I feel like I’ve known them much longer because of our interactions through #INeLearn. 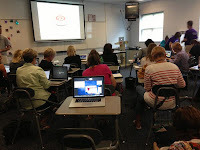 Carol Gardiner's session "The Engagement Application” was a great conversation around understanding how technology has changed the parameters of the powerful teaching and learning strategy, engagement. 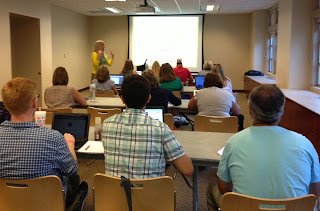 Allie Holland’s session “Digital Citizenship” focused on developing positive examples that you can point to when a concern arises, how to address problems that do exist and the overall necessity to be having these discussions not just in your schools but in the extended community. Conversations were not limited to sessions. The conference committee thoughtfully arranged for lunch conversations to take place around topics. 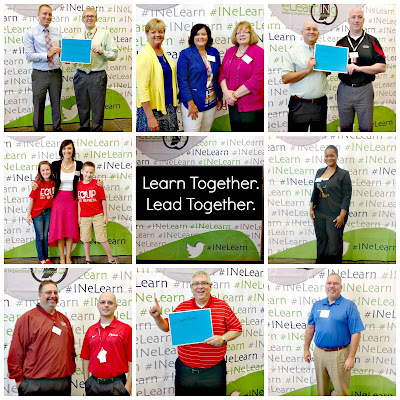 I invite you to continue those discussions on Twitter using the #INeLearn hashtag. Join us on Thursdays for chats and connect with some really great strangers. With eleven conferences left on the calendar, The Summer of eLearning not only heats up in July, it offers you several options for professional growth. When will you take time to learn something new or better yet, learn in a new way?